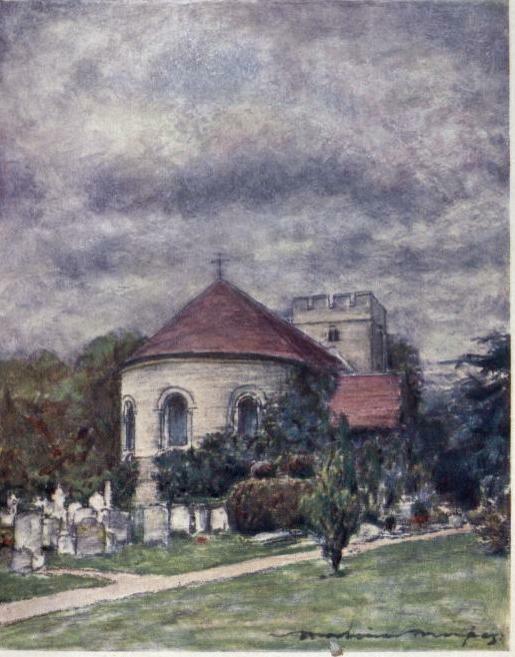 Goring Church by Mortimer Menpes, R. I. Source: “Twin Villages,” The Thames, 60. “From the river the church is easily seen. A small and narrow backwater leads under a bridge to within fifty yards of the tower. The building is very old, and was originally the church of the Augustinian priory. It is partly covered with rough stucco, which is peeling off untidily in patches. The tower is Norman, and has a bastion turret, which greatly adds to its appearance, and, what is more uncommon, the east end is an apse, though we are bound in honesty to say an apse rebuilt” (61).